Do you hear scratching or strange sounds in the attic? It could be squirrels! 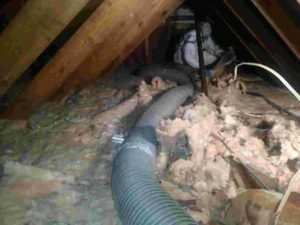 They can make nests, leave messes and ruin all of your insulation to the point where it needs to be removed and replaced. Trappro will remove the squirrels, clean up the mess, and seal up the holes where they chewed their way in. If you suspect squirrels are in your attic in Laurel, MD, contact Trappro as soon as you can!